Nearly three out of four children around the globe experience violence each year. That's according to a new study of children in both rich and poor countries. What's more, the report confirms that violence in childhood is linked with violence against women. Children who witness abuse of their mothers are more likely to become victims or perpetrators of abuse when they grow up, it said. 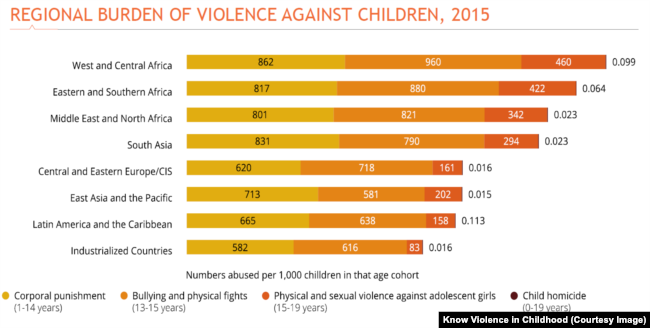 The report, Ending Violence in Childhood: Global Report 2017, was issued by Know Violence in Childhood, an international advocacy group launched three years ago in India. The study found that violence in childhood is nearly universal, affecting 1.7 billion children over the course of a year. This includes bullying or fighting, sexual abuse, corporal punishment at home and in school, and sexual violence.